Batam - Hang Nadim Airport Manager, Batam, collect data from fragments of type Airbus A380 Qantas flight that crashed in the area of Batam. 4 Houses were damaged by debris hit the aircraft. 4 The house was located in the residential area of Castle Gold, Batam Center. At the airport review site, known to the walls of houses that are located nearby, which was damaged. "The possibility that first flake fell and did not hit the roof of the house but the reflection of debris that hit the walls of the house and broken-down," said publicist Hang Nadim Airport, Hendarman, Thursday (04/10/2010). According to him, the fourth house was not all the walls collapsed. There are also crack due to engine aircraft debris. Luckily there were no casualties from the incident. According to Hendarman, several pieces of aircraft engines in the area of Batam Center has collected police. Debris was collected in the police station and police Batam Center Batam. Later all the pieces will be taken to Batam tenuous Mapolresta Galang (Barelang). These pieces vary in size, some small and some are about the size of the car door. Documenting the areas affected by debris was still done. "We also hope that residents who feel a victim of these fragments can be reported to the police or to the airport," he continued. 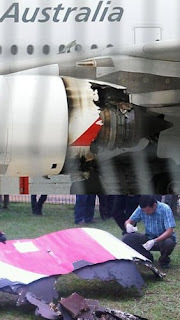 A number of splinter Qantas plane crashed in the area of Batam, Riau Islands (Riau Islands). Certainly the pieces the plane was coming from the bodywork. Because, when the aircraft emergency landing at Changi Airport, Singapore, body peeling and burning machine. This Qantas plane emergency landing safely at Changi Airport around 11:45 pm Singapore time. This aircraft was circling in the air Batam in smoky conditions. In fact, some residents in Batam heard an explosion from the plane was flying rather low. Allegedly the blast originated from aircraft engines which then knocked out the machine body and auto parts. It has a London-Sydney route by transporting 443 passengers and 16 crew. After flying from London, the superjumbo is then transit at Changi Airport, Singapore. After take off from Changi and headed for Sydney, the plane experienced engine trouble while on Batam. No injuries were reported in this Qantas accident. Flakes are also about building planes and cars in the area of Batam Center Avanza. In addition, the giant plane fragments are also on the roof of the Eden Park Elementary School 007 Batam Center, even a student and teacher were wounded.